Anniversaries really are such special events, even more so when it is such a milestone year as was the case for Eric and Chrissy on Friday. 50 years married and a Hog Roast Chichester to celebrate! As it was their golden wedding anniversary, they had invited their nearest and dearest friends and family round to share the celebrations with a delicious Hog Roast Chichester. As I’m sure you know the weather lately has not been anywhere close to desirable and with temperatures set to plummet even further Chrissy was almost considering cancelling the party as she had been relying on us catering outdoors due to there not being much room indoors once all the guests arrive. Once we heard of her concerns, we were able to quickly reassure her that the Hog Roast Chichester could still go ahead! Our machines are tough and durable and give out plenty of warmth themselves so we were confident we would still be able to cater outdoors but advised that the guests may want to remain inside as it was set to be a cold one! On the day of the anniversary party we arrived on a crisp morning and set up our Hog Roast Chichester machine, eager to get the meat on to cook as soon as possible so that the meat itself would be nice and tender and so that we could warm ourselves up! 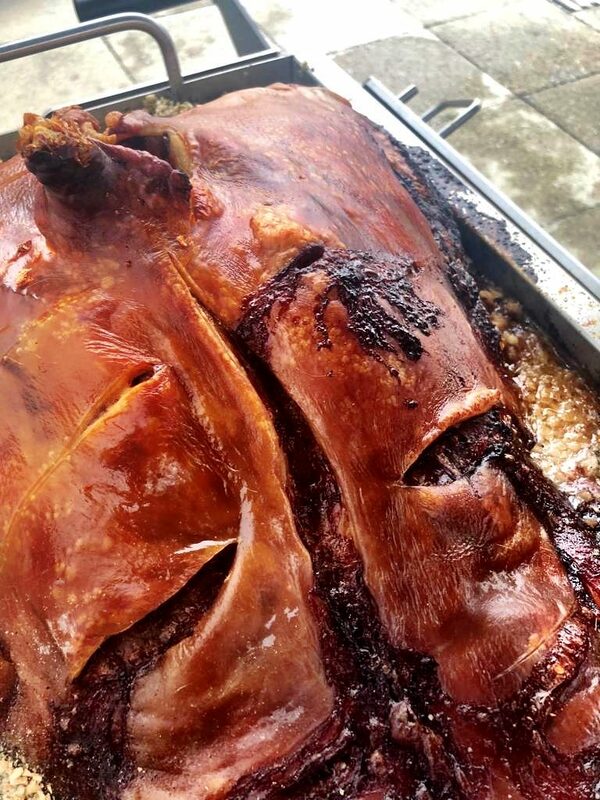 Chrissy and Eric had asked us to create our classic hog roast menu that consisted of our famous slow roasted free-range pig that we cook gently for several hours over hot flames. This was to be paired with our specialty homemade applesauce and moist sage and onion stuffing. Of course, not to forget the pièce de résistance – the crackling that we place on top. This would all be served in freshly baked floured rolls and really would be the ultimate winter warmer on such a cold day. Congratulations on your anniversary, Eric and Chrissy! It was lovely to be a part of your day. Hog Roast Littlehampton Caters For Staff Event!